When you walk into Hairitage, you will be greeted by Jax and Sophie, Angie Thomas’ two Shih Tzus who are always ready to welcome their clients. Pictured are salon greeter, Jax, sitting in the lap of a client who wishes to remain anonymous, and salon owner Angie Thomas. Thomas graduated from high school and beauty school the same year and went to work for Jeanette Holbert at The Golden Hairpin. 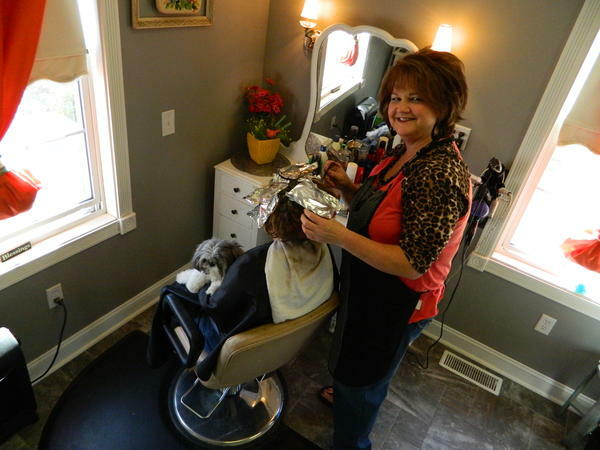 In 1985 Thomas opened up her Salon, Hairitage, next to American Legion in the old Phelps building. In 2006 Thomas had an addition built on to her home and moved Hairitage to the current location in Thomas’ home. Thomas had thought she didn’t have a calling, “I prayed that God would show me what it is He had for me to do. You know, you think of a calling as something that has to do with church or teaching, but we are called to further his Kingdom every day.” Thomas said. The Hairitage offers cuts, foiling, color, perms, waxing, special occasion styling. By appointment only, open Tuesday through Friday, close at 7 p.m. Located at 1445 Campbellsville Road, Hodgenville, phone number is 270-358-8012.